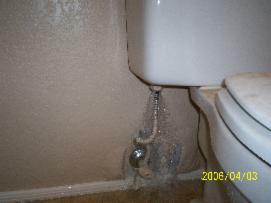 AZ Environmental Contracting, Inc. offers full service water damage restoration, 24 hours a day, 7 days a week. Below we have prepared a simple presentation that gives an overview of the water restoration process. Broken water pipes can cause severe damage to walls, cabinets and flooring. On average, a 1/2″ pipe, depending on water pressure, will release between 14-21 gallons per minute. That is from 840 to 1260 gallons in an hour, which will spread rapidly throughout your home and affect multiple rooms, along with furniture and personal belongings. In order to minimize the damage, it is important to act quickly. By removing standing water, it stops the spread of the water and reduces the amount available to soak into the walls and furniture. Once the standing water is removed, or “extracted”, the restoration phase will be ready to begin. 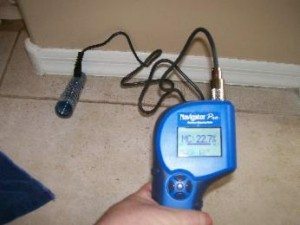 Using a variety of meters to measure the moisture content of building materials helps to determine the affected area of a flood damaged building. Once a complete inspection has been made, a strategy can be developed to determine the most efficient and cost effective method to dry the building, along with the type and amount of drying equipment. The longer water is allowed to stand, the further it can spread and the more damage it causes. If it is determined that there is non repairable damage to walls, floors, or cabinets, it is often best to remove them instead of drying them. 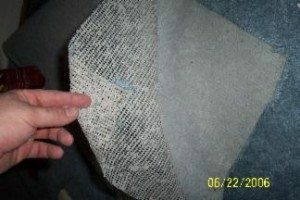 The less material there is to dry, the quicker the drying process will progress. Once all initial cleanup has been completed, it is then time to setup the drying equipment. Depending upon the size of the job, this can range from a single fan, multiple dehumidifiers, air movers, and specialty drying equipment. 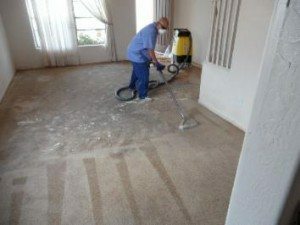 While the property is drying, it will be constantly monitored to make sure it is drying properly, and any other labor that is necessary can be performed over the course of the dry out. 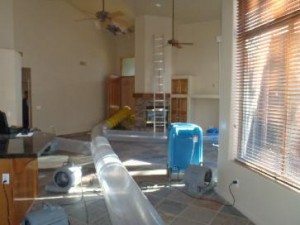 Have further questions about water damage restoration? Feel free to call or email us, and we will be more than happy to help.